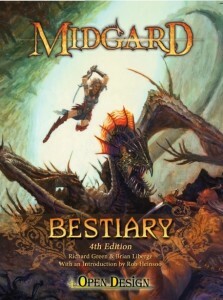 This week, the Midgard Bestiary: 4th Edition Dungeons & Dragons Edition by Richard Green and Brian Liberge became available! With over 150 monsters in it, this book is sure to please every monster-loving gamemaster out there. One of your fellow monster-lovers, Brian Liberge, gave us some of his words about what he found fun while he worked on this project. Come take a look. One of the things that are really exciting about the Midgard bestiaries is how familiar some of the monsters seem. Anyone who has played roleplaying games for a month has probably fought goblins, hags, and constructs. There’s something engaging about these familiar monsters. It’s a warm, nostalgic feeling that brings back memories of why you love the game. 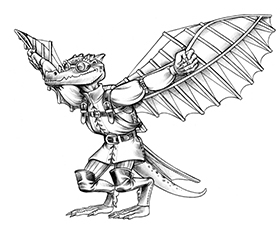 The Midgard Bestiary helps gamemasters twist those warm feelings into confusion and terror. We haven’t filled a book with creatures your players could fight in their sleep. Instead, mixing with brand-new monsters, you’ll find creatures that look familiar, but have a number of tricks up their sleeve. The putrid haunt is one of my favorite examples, and it was a joy to work on. Zombies are a classic, and 4th Edition already has a number of them to choose from. 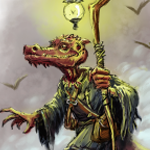 The AGE Bestiary presented this zombie variant that lies in wait in swampy marshes and then attacks. For the 4E version, we knew we wanted to present the putrid haunt in multiple ways. The end result really plays up the tactical element of 4E combat without sacrificing cool story and imagery. Putrid haunts are undead whose necrotic energy has taken on some of the elements of their final resting place—namely the swamp. Each has some elements of a lurker while still being as tough as a zombie. Each one uses the swamp as a weapon in a different manner. Some will retch a volley of necrotic leeches, others will hold enemies underneath the tainted water and others . . . well let’s just say that you’re going to want to give the last kind a wide berth. Retelling classic monsters was one of my favorite parts of working on the Midgard Bestiary. I hope it brings your players joyous nightmares.